We are in Flagstaff Arizona and it is snowing. By their standards it is nothing but to us it is big deal. This seems like a good day to get caught up with the blog. One of the things I have been working on is finding a better way to do photos. Bolgspot which I use for the blog is difficult and time consuming to upload very many photos. It took 3 hours to upload the 20 pictures that are in the Carlsbad Revisited blog entry. I have been researching other methods and for now at least I will be using PhotoBucket to do photo albums. If you click on the links you can see the albums or run the slide show. I haven’t mastered PhotoBucket yet so the pictures may not be in sequence, but. with time I should be able to edit, organize and caption the pictures. After we left Albuquerque we drove 233 miles into a head wind (naturally) to Holbrook, Arizona. It is about 20 mile west of Petrified Forest National Park. There isn’t any camping in Petrified Forest National Park, the choices are few and old in Holbrook so we picked the one furthest from I – 40. As you can see by the pictures the spaces are very close together. Neither Kathy nor I had been to Petrified Forest National Park since we were young children moving west with our families, so after more than 40 years we were anxious to see the park. When we arrived at the park we found that we had left Kathy’s camera back at the trailer so we stopped at the visitor center and bought a disposable camera. Petrified Forest National Park is the most dog friendly park we have ever been to. In most parks dogs are not allowed on the trails, however at Petrified Forest dogs are allowed on all maintained trails. The road through Park is 28 miles long so the three of us (Raider included) stopped at every turn out and walked every trail from the north to the south end of the park. Although we hiked 6 miles and spent all day in the park we ran out of time and energy, we didn’t get to do the last trail. Since we just weren’t sure of the quality of the disposable camera we came back the next day and the three of us stopped at every turn out and walked every trail from the south to the north end of the park again. Including the trail we had missed the day before. At this URL you can see a slideshow of the pictures that Kathy took with both her Canon and the disposable camera. They have been on the road for just over two years and I have been following their blog all of that time. Over the two years we have occasionally exchanged emails. 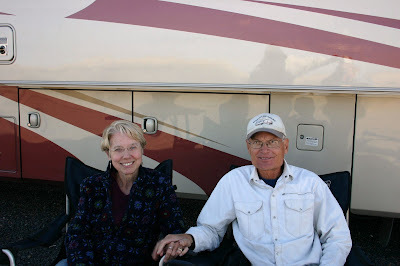 Bob and Linda have done a number of volunteer positions in their travels and have returned to Petrified Forest National Park for a second year. It was great to meet them in real life and to learn more about their experiences as volunteers. Kathy and I hope to do some volunteering in a park or wildlife refuge somewhere in our future. It is always a little strange to meet bloggers that you have been following, as they are meeting people they don’t know and haven’t seen while I am meeting people that I have seen in 100s of pictures and I know everything that they have done for the past two years. After two days of hiking all three of us needed a rest day and then we had a day to take care of laundry and groceries. After Holbrook we drove into a head wind (naturally) to Flagstaff, Arizona. Kathy and I think we have only had 2 non-windy days in the past 3 months. 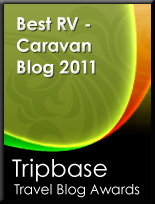 The RV Park is very nice and has just opened for the season. There are 50 sites, but only 6 or 7 have been in use on any night. Flagstaff is at 7,000 feet and the nights have been at or below freezing. One of the very special things here in Flagstaff is the Lowell Observatory. The Lowell Observatory was built in 1894 by Percival Lowell and has always been and continues to be a private family owned Observatory. In 1896 Lowell had a 24 inch refracting telescope installed (the largest of its time) for his study of Mars. Over the next 23 years of his life Lowell produced drawings of the canals of Mars, wrote books and lectured all over the world about the canals of Mars. He spoke of the advanced civilizations that lived there. Of course, he was wrong but, he didn’t live long enough to find that out. Lowell also predicted that there was another planet beyond Neptune. The Observatory had another telescope built to look for a 9th planet. In 1930 Clyde Tombaugh discovered the planet Pluto (now dwarf planet) here at the Lowell Observatory. We went on the absolute best observatory tour ever and got to see both of these historic telescopes. Unfortunately, we didn’t bring the camera so we didn’t get any pictures! I had last been to Grand Canyon National Park in 1972 and Kathy hadn’t been there since 1965, it has been very high on our list of things to see in Arizona. 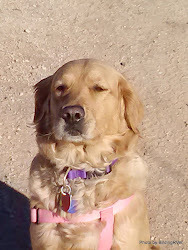 It also turns out that Grand Canyon is dog friendly; they allow dogs on all trails above the canyon. So the three of us started at the Watchtower at the east end of the south rim and then stopped at all of the overlooks until we got to the west end of the south rim. The day was sunny at first then turned to gray and threatening rain later in the day, so the colors were muted. The canyon was very green with all of the new growth. I was shocked at how crowded it was near Mather Point and the visitor center considering it was a Tuesday in April on a cold windy day. We also picked up a few new year birds: White-throated Swift, Mountain Chickadee and Violet-green Swallow. This is the URL for the slideshow of the pictures Kathy took while we were at Grand Canyon. Please have a look. I think that brings us up to date with what we have been up to. Oh yeah, I forgot to mention that during all of this it has been WINDY!! !